Follow the good mule as he wends his way through the Laines of Brighton. Watch the masquerade unfolding down St James’s Street, unearth the unexpected at Festival time and float among the clouds in a library of dreams. Revisit the charm of Hanningtons and legendary nights at The Zap. Admire the spirit of the West Pier and a football club clinging to the cliffs. Picture Careme the father of modern cuisine, spinning castles out of sugar and raging at the heat. Feed the five thousand from a kitchen under The Arches, with a telescopic windown out to the sea. Follow the hoof prints onto the Downs, returning laden with honey and cheese. Savour a plaice at the Regency restaurant, and scavenge among the rock pools on Ovingdean beach. 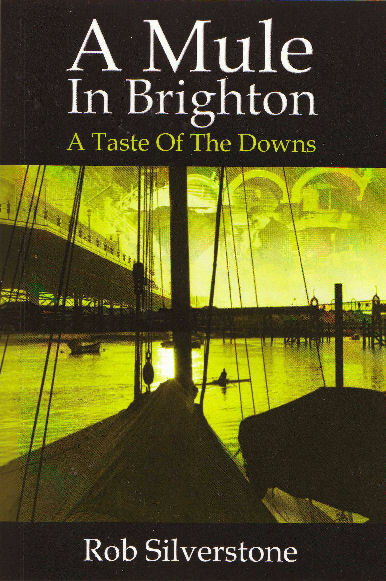 Infuse the café culture like a native, a little tale of Brighton that’s good enough to eat. And this certainly is a good resume of the delights to be found in this terrific book. Amongst other interesting aspects, it has a stroll down memory lane, a view of contemporary Brighton, a visit to heritage sites, a photographic gallery and even some terrific recipes. It is a book which will be enjoyed by residents and visitors to the city alike. Presented in an easy going and accessible style it offers something for everyone.